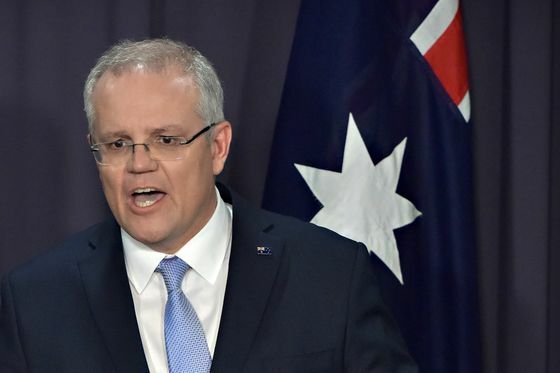 (Bloomberg) -- Australian Prime Minister Scott Morrison will call a May 18 federal election on Thursday, Sky News reported, with polls showing he’s facing an uphill battle to prevent a shift in power to the left-leaning opposition Labor party. Morrison returned to Canberra on Wednesday night, intensifying speculation he is set to visit Governor-General Peter Cosgrove to dissolve both houses of parliament, Sky reported. The election campaign will be dominated by the stark policy differences between Labor and his Liberal-National coalition, which is vying for a third straight term. They include everything from cutting taxes to boosting wages to reducing emissions in one of the world’s worst per-capita polluters. The government has just 73 seats in the 150-member lower house to 69 for Labor, losing its majority after defeats in special elections. Since replacing Malcolm Turnbull as prime minister in August, Morrison has been unable to narrow Labor’s lead in the polls. The party led by former union leader Bill Shorten, 51, was ahead by four points in the latest Newspoll.